After a full survey is undertaken, our technicians will advise you on the type of Gull proofing required. Whether it be the use of Gull Anti Perch Spikes, Gull Spring Wire, Gull Netting or Gull Wire Mesh, we are fully qualified to install and maintain if required. We can undertake full cleaning of Gull Guano material and Gull nesting with the use of specialised chemicals to remove all bacteria and germs. We do not advise that you undertake cleaning of Gull mess/faeces due to the many diseases that can be found including: Histoplasmosis, Cryptococcosis, Psittacosis to name but a few. There are however some other ways in which we can control Gulls, manage and prevent Gull infestations. The use of scaring devices such as audio distress calls can result in gull sbeing moved on. We are able to install such devices to premises where gulls are causing a nuisance. A technique where the building needs to keep its structural appearance free of other proofing methods such as spikes or wires can be installed. this is an electronic wire system that sends a pulse out every few millisecond. When the bird comes into land on the ledge, it will land on the electronic wire and recieve a small shock, enough to startle the bird leaving it to fly away. Egg pricking can also be implemented. This is where the eggs are oiled or replced by fake eggs. this is best carried out when the adult gull is not present as they can become very aggressive when young are in the nest. Nest removal and egg removal can also be carried out but is not that successful as gulls will try to relay eggs prolonging the breeding season. If the nest is to be removed, regualr visits will be required to remove eggs. these methods of reducing reproductive output are long term approaches that might not keep pace with recruitment of new breeding birds from outside the colony. The Herring and Lesser Black Backed Gulls are the most common and important species of gull in the UK. Their nests are normally laid alongside other gulls colonies. Once a breeding site has been established, they will return year after year . 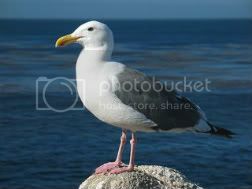 the gull starts breeding at the age of 5 years and can live for approx. 25 years. Eggs are laid in the months of April or May with up to 3 eggs being laid. these are laid at intevals of 2-3 days and will need incubating for 28-30 days. the young take their first flight when they are around 5 days old but will continue to stay with the nest for 5-6 weeks. Normally there is a single successful clucth of eggs laid each season, though second broods have sometimes been reported. If the eggs are removed or destroyed just after being laid, the gulls may relay eggs prolonging the breeding season. If they require to be removed, nests will have to be checked on a regular basis. The damage caused by Gull arises from their infestation of an area. Food stored can be eaten out of warehouses and processing plants may be eaten and fouled on. Fouling of buildings and monuments frequently occurs where the Birds rest or roost. Not only is this unsightly, but also can damage as the acidic droppings can erode the surface or stonework. Gutters and drains can be blocked, leading to flooding etc. Paving, ladders and fire escapes can become unsafe, as the surface can potentially be slippery. The guano produced by the Gull is also a known disease carrier or Ornothosis and Salmonellisis. Although the incidence is low, the public health hazard cannot be ignored, particularly when dealing with food premises.